It’s Secret Recipe Club time again!! As usual I told Price to check out the blog and to pick out the recipe that I should make for this month. I only specified that I didn’t want to make a cake or cookies. So Price headed over to My Beautiful Disasters and checked out the recipes that Casey has made. 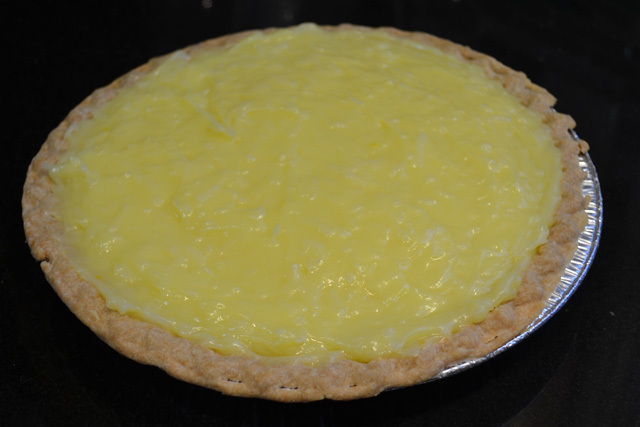 He picked out the Coconut Cream Pie as I’ve been saying that I want to try to make more pies. We loved this pie. It was so easy to make and tasted so good. Casey remarked that when she made it that it didn’t set up well. I didn’t have trouble setting it up but I did recently cook a chocolate pudding pie so I figured I would make sure I get it thick enough while cooking it instead of having it set up while chilling, just like when I that one. It just took some time and patience to stand there and stir constantly but it totally was worth it. I’m so glad that Price picked this recipe from Casey’s blog. It was a fantastic recipe to make for SRC. I only wish I had planned enough in advance (when will I learn?!?!) to make her homemade pie crusts. I just grabbed a 9″ pie crust from the grocery store and baked it according to its instructions and let it cool completely. Simple. The only thing I did different was that I used the coconut extract instead of the vanilla extract in the whipped cream. I just wanted it to scream coconut! 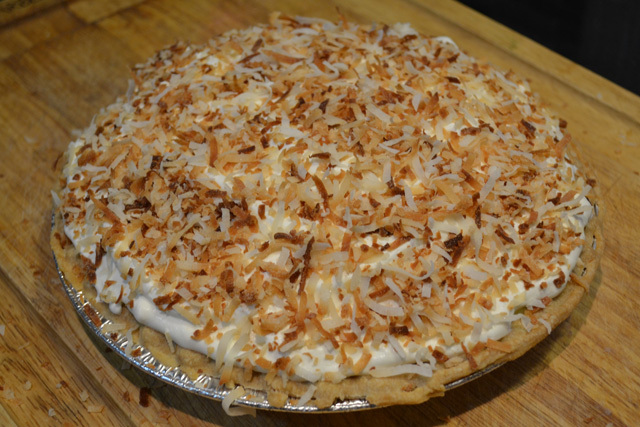 If you love coconut then you’ll love this coconut cream pie! Use either a purchased pie crust or a homemade one. Pre-bake according to instructions/recipe, allow to cool completely. Preheat the oven to 350. 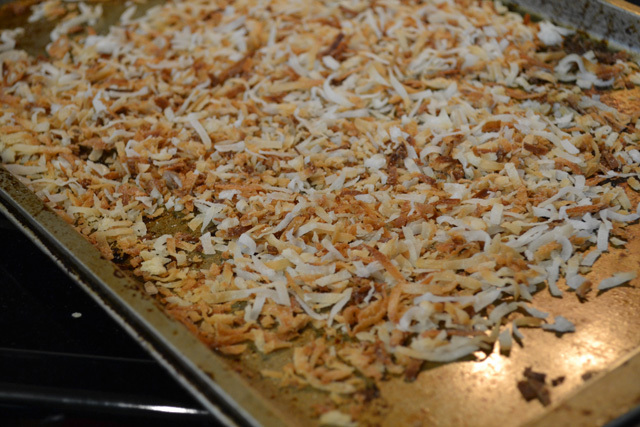 On a rimmed baking sheet, spread out the 1/2 cup of the shredded coconut. Toast for 5 minutes, or until golden brown. Let cool. 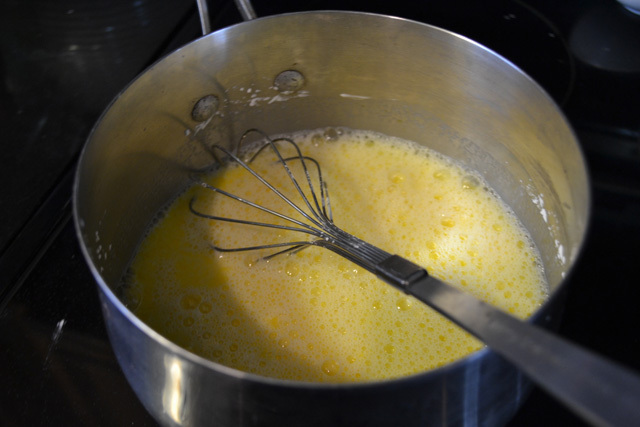 To make the filling, combine the yolks, milk, sugar, cornstarch, and salt in a heavy bottomed saucepan; mix well. 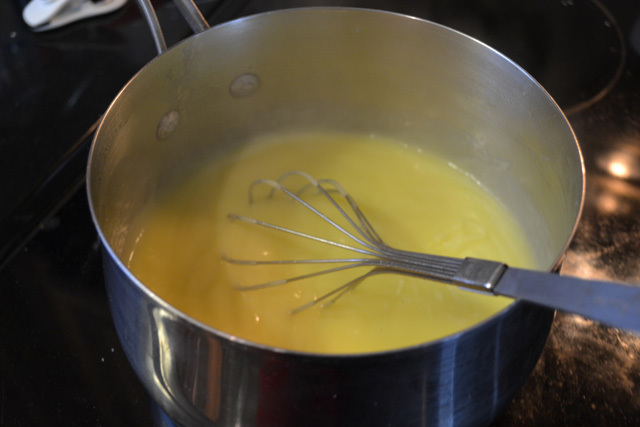 While continuelly stiring, cook slowly over medium low heat until the mixture bubbles and begins to thicken. 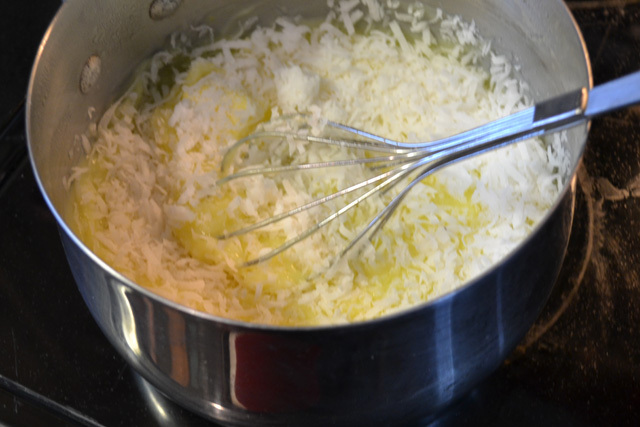 Reduce to low and stir in the coconut and butter. Continue to cook and stir until very thick, approximately another 5 minutes. Remove from the heat and stir in the coconut extract. Cool the filling approximately 10-15 minutes prior to pouring into the pie shell. 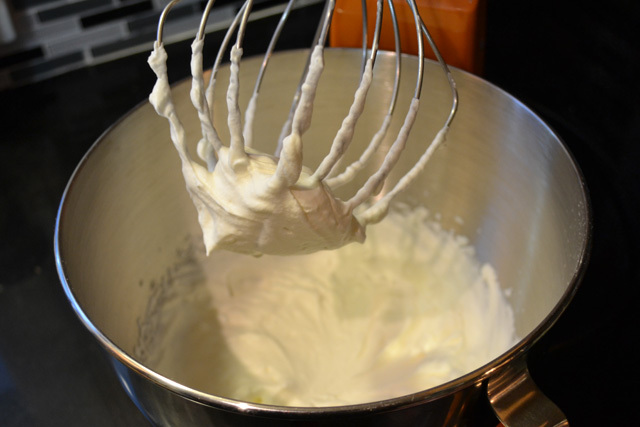 Whip the whipping cream over medium speed. Once it begins to thicken, add in the powdered sugar and extracts. Evenly spread the whipped cream over the cooled pie. Sprinkle the toasted coconut over the whipped cream. Serve chilled. Oh man! This looks amazing! And surprisingly, not TOO difficult… this would be a perfect Easter dessert! I love coconut. I will definitely be making this in the future! I too am working at becoming a better pie maker. 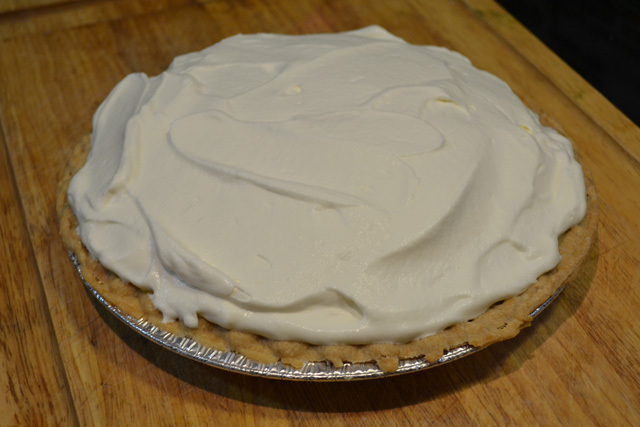 This is going to be my next pie–I do love coconut cream. It just might appear on my Easter table. Thanks for the inspiration, I do love SRC. I a.d.o.r.e coconut cream pie, but have never made it. Yours looks truly lovely……I’ll have to give it a try! 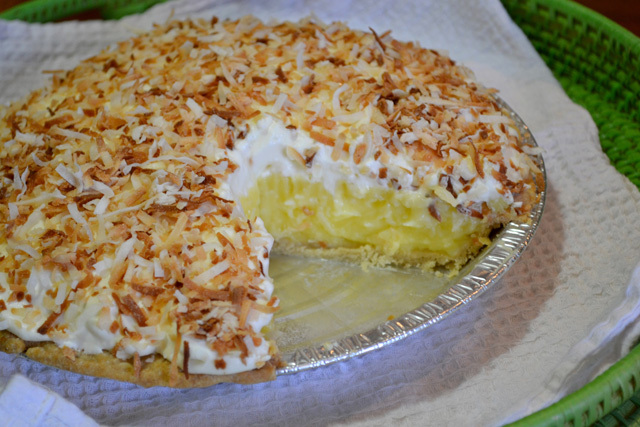 Coconut cream pie is one of my favorites! Now I have a huge craving!!!! Happy Reveal Day! I would be making this without a doubt for Easter if my husband liked coconut more. hello…I need this in my life!! Your coconut cream pie is so pretty! I haven’t had a pie like this for a long time….looks yummy! Great SRC pick! You hit it out of the park with this coconut cream pie! It looks wonderful! Look at that creamy filling and crunchy topping! I may make this for Pie Day to bring ti work!